Stronger and cooler easterly winds with heavy rain early morning decreasing by mid afternoon with thick cloud failed to produce anything spectacular but a few new arrivals joined the many lingering migrants, with 37% coverage achieved. A Grasshopper Warbler trapped at the Observatory and 2 Barnacle Geese by Holm were new, as were females of Kestrel, Sparrowhawk and Merlin. 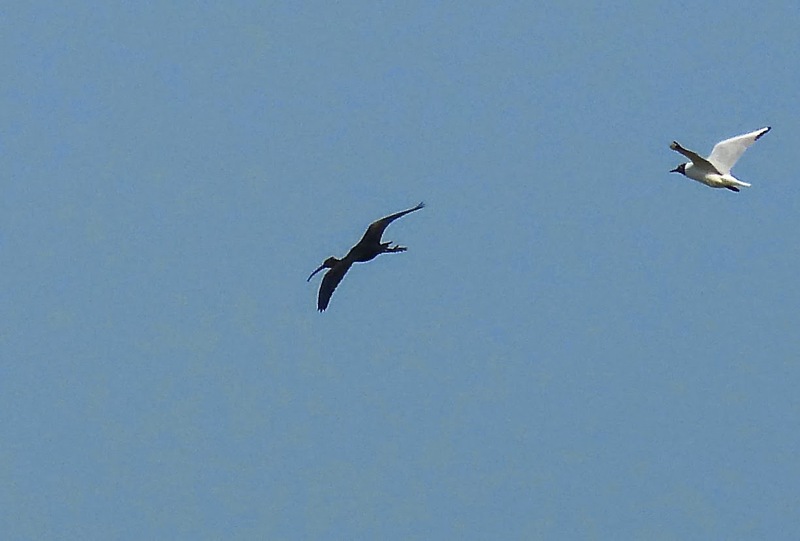 The Glossy Ibis remains faithful to the school brae, a Wryneck at the Observatory and Hawfinch near Holland are presumed to be those seen previous. 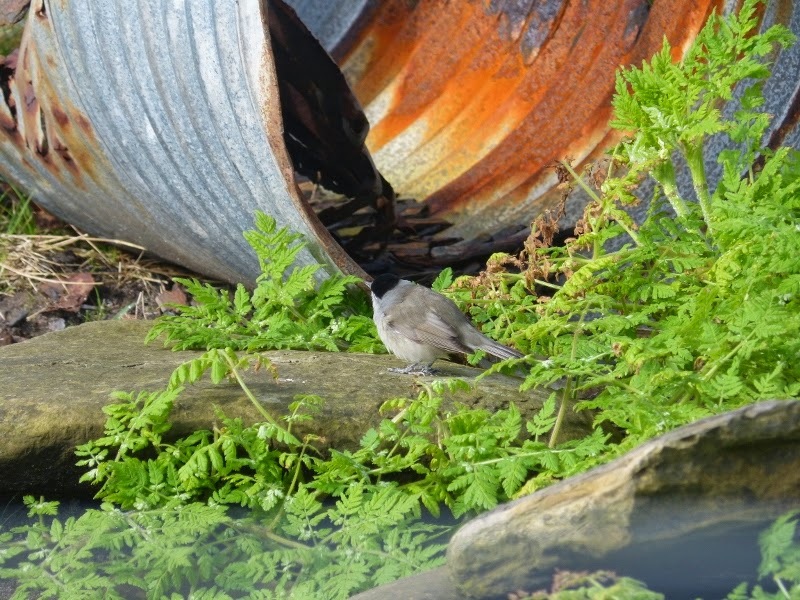 The year's first Sedge Warbler was at Hooking, one of many breeding areas on the island for this species and a female Black Redstart was at nearby Hooking. Common Redpolls increased to 9, Snow Buntings to 3 and Wheatears to123. The final exciting note of today was our first Lapwing chicks, the first of many we hope. The former date produced two new additions with 2 Goldfinch and a Common Sandpiper seen. another Wryneck was trapped and ringed, this time at the Observatory, where the Blue-headed Wagtail was still present as was a rather showy and very smart male Black Redstart. The female Hawfinch was seen again at Holland and the Glossy Ibis was seen on both dates. Other migrants on 28th were 9 Sandwich Terns, 2 Collared Doves, 3 Tree Pipits, 2 Redstarts, 3 Lesser Whitethroats, 15 Blackcaps, 17 Chiffchaffs, 10 Willow Warblers, 3 Pied Flycatchers and an increase of Corvids with 9 Rooks, 5 Carrion Crows and 21 Hooded Crows. The 29th saw slight increases in wildfowl with a flock of 11 Goldeneyes flying north and a drake Garganey on Brides' Loch with 39 Teal and a Pink-footed Goose. 5 Whimbrel and 218 Purple Sandpipers were an increase on recent totals, whilst 2 Redstarts in Holland Gardens were presumably lingering birds as were the 3 Woodpigeons and 3 each of Lesser and Common Redpolls. A fine sunny day with continuing light easterly winds saw birds arriving throughout the day. Only 30% coverage was managed but numbers were up, the bird of the day being a Wryneck trapped and ringed at Holland. Also there was the Hawfinch still, with other presumed hangers on being a Wood Warbler at Gue, Green Sandpiper at Trolla Vatn and Blue-headed Wagtail by the Observatory. Calm seas enabled counts of 12 Great Northern Divers around the coast and a single Grey Heron. A female Black Redstart was at Rue and the first Whitethroat was also there. Other totals included 3 Black-tailed Godwits, 2 Whimbrels, 3 Woodpigeons, a Collared Dove, 5 Sand Martins, 24 Swallows, 7 Tree Pipits, White Wagtail, 3 Dunnocks, 35 Robins, 2 Redstarts, 67 Wheatears, 8 Ring Ouzels, a flock of 170 Fieldfares, 18 Song Thrushes, a Redwing, 2 Lesser Whitethroats, the year's first and our earliest ever Garden Warbler, 22 Blackcaps, 28 Chiffchaffs, 18 Willow Warblers, 2 Pied Flycatchers, 10 Bramblings and a Common Redpoll. The weather was as yesterday but the wind dropping as the afternoon progressed and coverage was about 35% excluding netting hours. A reduced number of migrants was clear from the off and many of yesterdays birds remained including the Hawfinch and Siskin at Holland and presumably the 2 Lesser Redpolls trapped there. Notable new discoveries were thin on the ground but did include a Blue-headed Wagtail in the observatory Fields and the first Jack Snipe for some time. Other totals were 2 Tree Pipits, a Dunnock, 11 Robins, 3 Redstarts, 4 Ring Ouzels, 7 Song Thrushes, 2 Redwings, 10 Blackcaps, 12 Chiffchaffs, 5 Willow Warblers, a Pied Flycatcher, 2 Lesser Redpolls and 9 Bramblings. 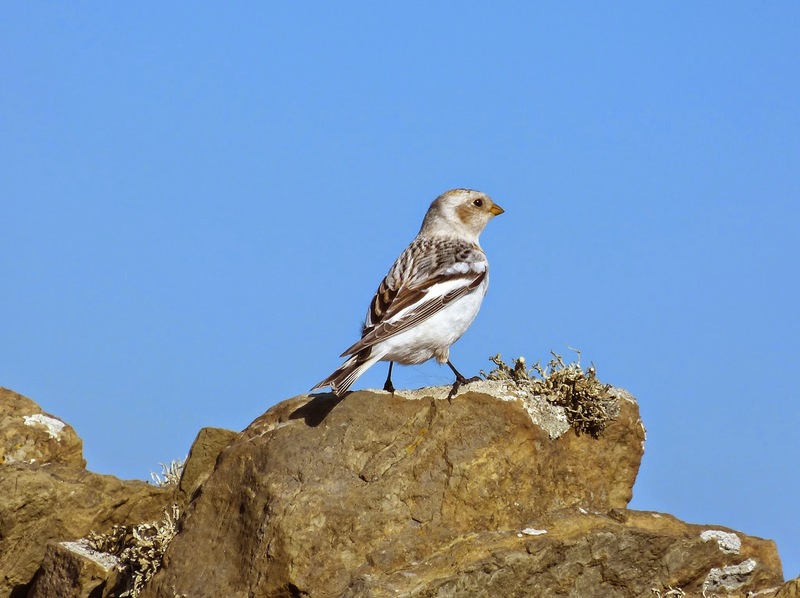 Once a few early patches of fog cleared away to leave us with low cloud and a moderate easterly wind, it wasn't surprising that migrants began to pour in and the day was without doubt the busiest of the year so far. We managed to achieve 40% coverage of the island while 8 hours were also spent manning the nets at Holland House where 67 new birds caught and ringed. There were no major rarities but an impressive roll-call of passerines included 12 Tree Pipits, 3 House Martins, 10 Swallows, 28 Robins, a Dunnock, 4 Redstarts, 65 Wheatears, 8 Ring Ouzels, 65 Fieldfares, 17 Song Thrushes, our earliest ever Garden Warbler (by 11 days!). 16 Blackcaps, 13 Chiffchaffs, 9 Willow Warblers, 2 Wood Warblers (also the earliest island record), 3 Pied Flycatchers, 65 Bramblings, 4 Lesser and 9 Mealy Redpolls and a female Hawfinch. There was also the first Greenshank and Green Sandpiper of the year while a Short-eared Owl came in off the sea. 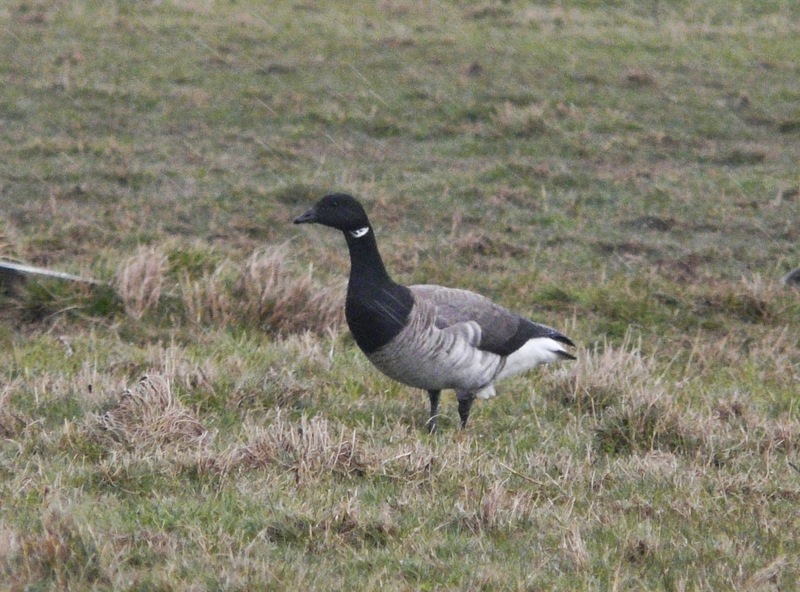 The Pale-bellied Brent Goose was still present and 11 Lesser-black backed Gulls were counted. A busy day! 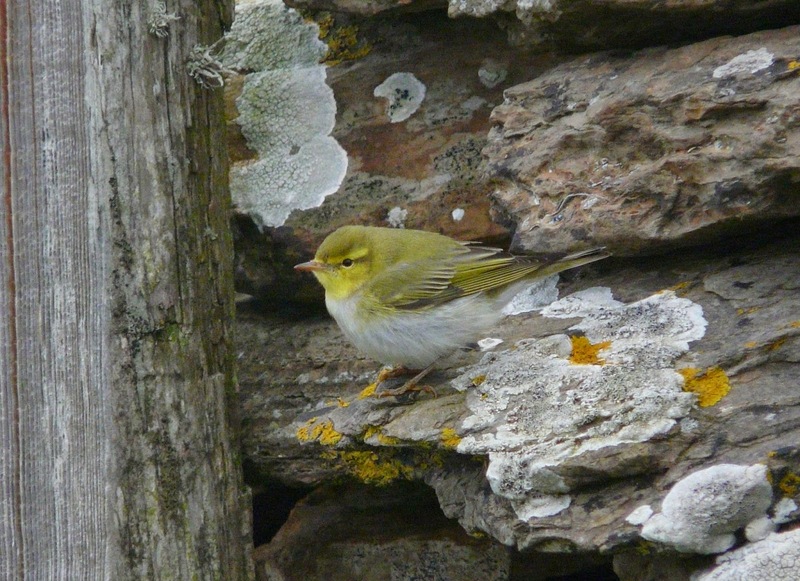 Easterly winds and fog continued with rain in the evening and still plenty of migrants new and old. The Glossy Ibis, 2 Ruff, Brent and Bean Goose remained and a Wryneck at Muckle Moo Geo was presumed to be the same also. A pair of Garganey were on the flash by Holm, and at Holland House a Tree Pipit and 5 Brambling were new and a smart Black Redstart was nearby. 2 Common Redpolls were at the bird observatory and a Kestrel was on the Lurn. Elsewhere 2 Whimbrel, 2 Dunnock, 14 Robin, a Redstart, 10 Chiffchaff, 3 Willow Warblers and a Snow Bunting. The first easterly winds for some time on the 22nd saw the start of an exciting looking forecast. Within the first hour or so Wryneck, Pied Flycatcher and Redstart were added to the year list, followed soon after by Tree Pipit. Migrants were well scattered but the majority were in Holland or along the sheltered west dykes, these included 11 Robins, 4 Ring Ouzels, 3 Woodpigeons a Brambling and a White Wagtail. 10 Black-tailed Godwits and the pale-bellied Brent Goose were near Hooking where 356 Black-headed Gulls were counted on the Loch (The island's main colony) and rather puzzling was a Glossy Ibis too!? Despite an evening of fog the morning ringing session on 23rd proved a clear-out and a fresh arrival overnight and throughout the day 2 new Ruff, 7 Swallows, a Dunnock, 37 Robins, 71 Wheatears, 3 Redstarts, 7 Ring Ouzels, 6 Song Thrushes, 10 Blackcaps, Lesser Whitethroat, 13 Chiffchaffs, 3 Willow Warblers, 2 Pied Flycatchers, 2 Lapland Buntings, a Common Redpoll and late on, a flock of 40 Fieldfare flew south in the fog. 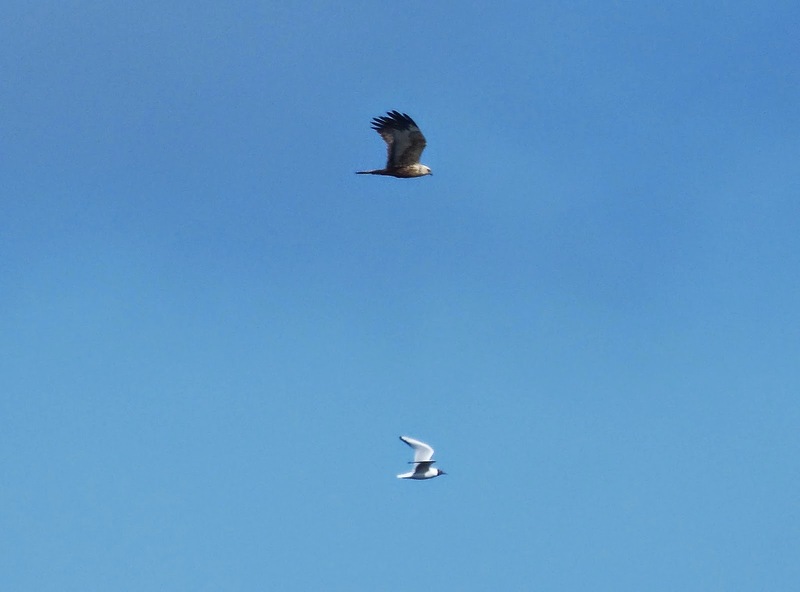 Once again a raptor was the highlight, this time a male Marsh Harrier, with single Merlin and Sparrowhawk also. The first Whimbrel arrived, a Ruff was near Phisligar and 35 Black-tailed Godwits included 18 heading south. Other southbound migrants were 2 Woodpigions, many Meadow Pipits and 8 Skylarks. The Pale-bellied Brent Goose was still present but with a touch of east in the wind smaller migrants began to appear with 4 each of Blackcap and Chiffchaff, a Willow Warbler, and singles of Common Redpoll and Snow Bunting. The 19th was previously decided to be the 'Tystie' count, the local name for Black Guillemot, as the sea state was flat calm. Fog first thing thankfully cleared enough and a healthy 551 were counted. Other notable migrants during the count were a Bean Goose at Bride's, 3 Willow Warblers, a Song Thrush and the earliest island record of Lesser Whitethroat. Later in the day with improved visibility a fine summer-plumaged Slavonian Grebe was found in Linklet Bay. Pochard on Bride's increased to 5 on 18th when singles of Fieldfare and Song Thrush were new as was a Siskin. 113 Sanderling and 6 Sandwich Terns were in Linklet Bay while 8 Rooks and Heron flew south. The Pale-bellied Brent Goose and a male Sparrowhawk were present both days but the 19th produced a Red Kite - second island record, and a locally rare Stock Dove. The latter hanging around the Holland area an the former heading south midday. 18 Common Redpolls dropped into Holland, 15 of which flew south soon afterwards as did 9 Rooks and 3 Carrion Crows. 7 Sand Martin and 2 Swallows arrived and a Snow Bunting was near Rue. After the morning and early-part of the afternoon was spent dealing with Sheep related commitments, the Spring 'sprung' into action once we eventually made it out into the field. There were 4 new species for the year, and 2 of these also achieved their earliest ever arrival date on North Ronaldsay. 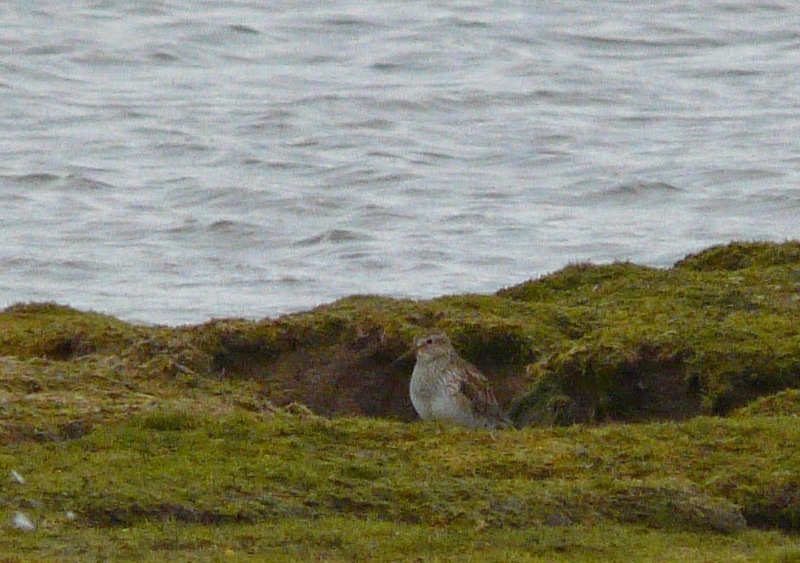 A group of 3 Dotterels on Torness were a day earlier than last years first and the previous earliest, while a Pectoral Sandpiper on Bewan becomes the first April record and is over 2 weeks premature of a past record on 1st May. Neither of these were 'bird of the day' though, that accolade went to the drake Goosander which was also on Bewan, albeit briefly-a less than annual bird here! Other sightings from a busy few hours included the first 4 Swallows of the year, 3 Sand Martins, 3 Collared Doves, 30 Wheatears, a few new Chiffchaffs and a Common Redpoll. There was also a 1st summer Iceland Gull seen and some 15 Great Northern Divers were off the north coast. If it wasn't almost dark, and if the Pectoral Sandpiper had been in focus-this could have been a decent photo! The weekend was a bit of a struggle with mainly lingering birds seen in the strong westerly wind and occasional spells of rain over 12th to 13th. 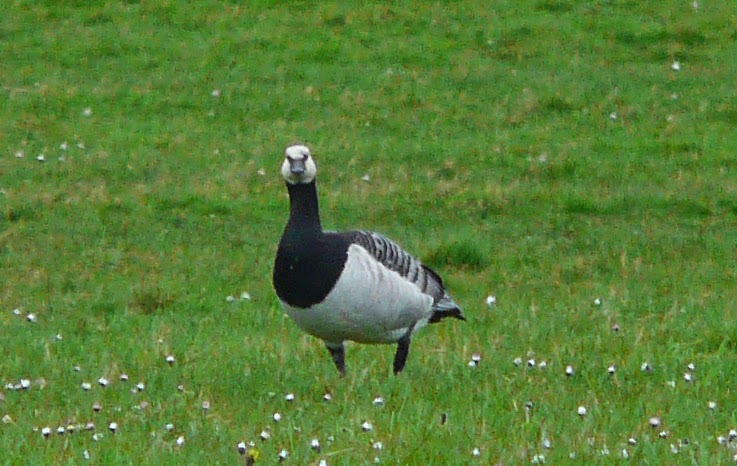 On the former date the Tundra Bean Goose was seen again with the Greenland White-fronted Goose on the latter and the 2 Ruff also remain. 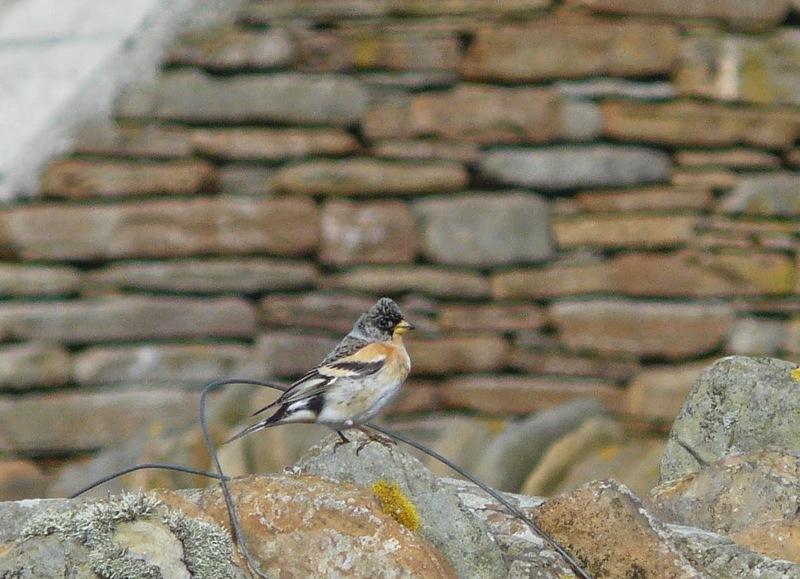 On 12th a 'littoralis' Rock Pipit was on the Links with single Grey and White Wagtails also there, while the pick of the passerines on 13th was a new Brambling among up to 4 lingering Chaffinches and 2 Rooks. A better day on 14th saw the wind drop in the afternoon and hopefully there'll be a few more birds getting moving tomorrow. A Short-eared Owl at Gravity was the first in 2014, while the first 4 spring Black-tailed Godwits joined increased numbers of Redshanks (45) and Oystercatchers (126) on Ancum Loch. A bright and breezy 10th was quiet, with the 2 Ruff from a couple of days ago re-located on the flash between Hooking and the School the highlight. The 11th was much better with more cloud-cover and a lighter wind from the south-west. 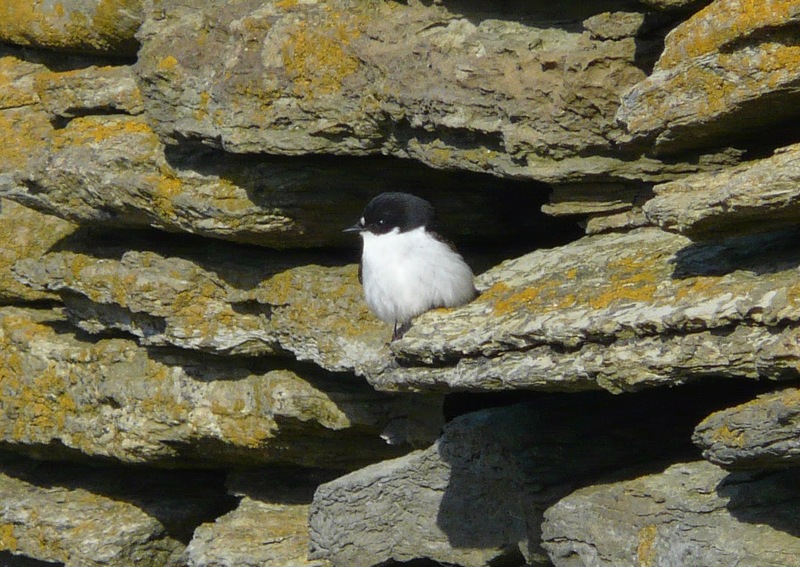 Both Sand and House Martin made their debut appearances for the year, the latter only a few days past the earliest island record-yet we still await our first Swallow. There were other birds on the move too, with another surge of 91 Skylarks, the majority leaving to the south while 5 Ravens and 5 Rooks also passed through in the same direction. A Jackdaw was also seen, along with a female Sparrowhawk, Black Redstart and a few more Wheatears. The Green-winged Teal was tracked down to Bridesness, and by repeating the behaviour pattern of our wintering bird and close scrutiny revealing some distinctive marks-we are confident it is the same bird which had last been seen in early March. A quieter spell as the south-westerly winds and bright conditions have resulted in a 'clear-out' of the majority of passerines. Only small numbers of Thrushes, Robins, Dunnocks, Chiffchaffs and Finches remain although Wheatears continue to trickle in, with many already setting up territory as other species leave. On 8th 2 male Ruff's, in partial summer dress were on the scrape at Westness when the Tundra Bean Goose and Canada Goose were both seen again. Similarly on 9th, the Greenland White-fronted Goose was the unlikely highlight with 7 Woodpigeons the only other thing of any note. 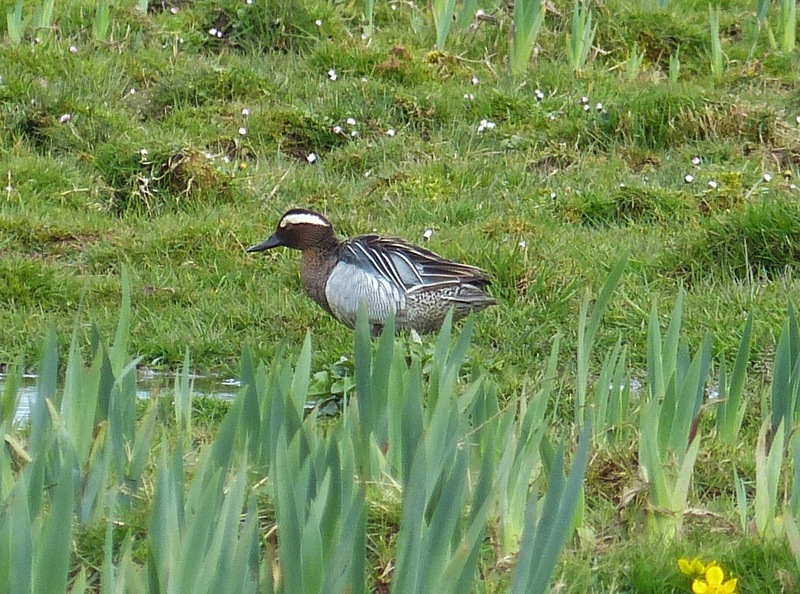 Another pleasant day, with the surprise discovery being a drake Green-winged Teal on Gretchen Loch. 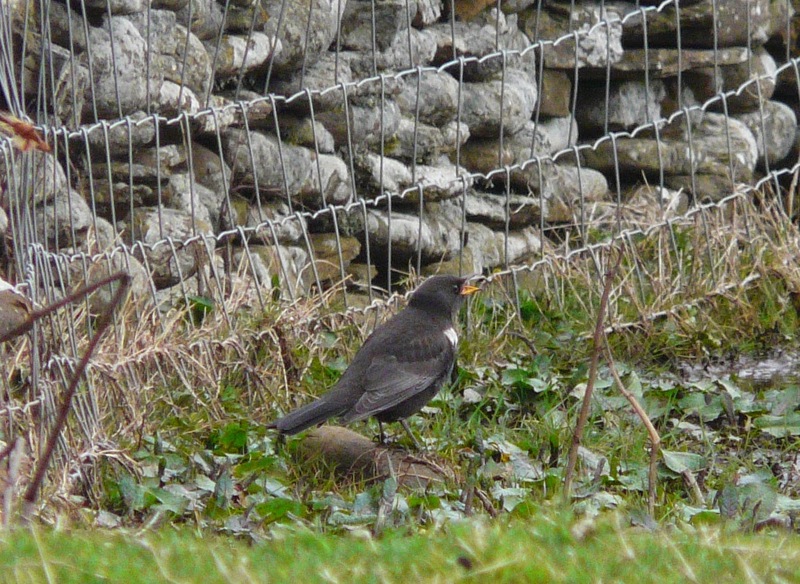 The jury's out at the moment as to if it's a new bird, or the wintering one (last seen 9th March) re-appearing. This is the classic time of year for American 'quacks' to get caught up with our northbound wildfowl, and 5 drake Shovelers also on Gretchen today add weight to this theory. At first glance it looks very similar plumage wise but we'll see what it does over the next few days and have a good look at the photo's before making a judgement. The clear night clearly encouraged many of the recently grounded passerines to get going again as both Robins and Dunnocks barely made it to double figures today. Meadow Pipits however, moved south throughout the day with the total of 329 merely a conservative estimate and 26 Wheatears also seemed to move on quickly. The first Carrion Crow of the year was also seen, 118 Fieldfares were the pick of the thrushes, 11 Woodpigeons and a Collared Dove were in the Holland area and 34 Curlews headed north. After the drizzle cleared early morning it was clear there were plenty of new arrivals on 5th. Fieldfares were particularly evident with at least 104 present, while there were also 4 Mistle Thrushes, 75 Blackbirds and a handful each of Redwings and Song Thrushes. It was the busiest day of the year for the ringers so far with many of 58 Robins, 20 Dunnocks and 10 Chiffchaffs (plus the thrushes) forming the majority of the 60 birds ringed at Holland gardens. 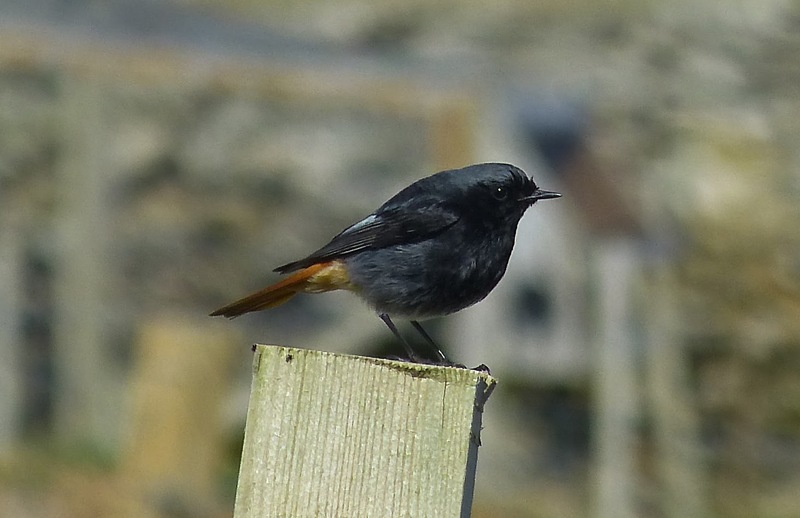 There were also 3 Woodcocks, 2 Black Redstarts, the first Blackcap, Grey Wagtail and some 257 Meadow Pipits seen. The 6th was much quieter with only a fraction of the birds recorded on 5th still with us. Most of the previous days Fieldfares and many other passerines had obviously moved but 2 Sandwich Terns in Nouster Bay were new. Roughly half the number of passerines (Robins, Dunnocks and Chiffchaffs) lingered on the 3rd when the only obvious new passerines were a couple each of Bramblings and Chaffinches. The Great Grey Shrike was seen again at Holland first thing, but not subsequently while a Grey Wagtail seen both days, wasn't far away from where it had been at the end of March so was presumably a lingering bird. A bit of rain overnight and early morning on 4th didn't seem to do what we'd hoped it would-perhaps the 'smog' further south is preventing things from moving? There were a few more Robins on the coast though, the first Ring Ouzel of the year was near the airfield, and once the drizzle cleared a few flocks of northbound Curlews were noted, totalling 33 birds. More easterlies, more sunshine and more pleasant birding-the islands really is a fantastic place to be at the moment! The first wave of Blackbirds was evident on 1st, and although the numbers weren't huge, 13 trapped and ringed in the morning was a clear sign of an arrival. There seemed to be slightly fewer Robin's and Dunnock's, especially once the sun came out so perhaps they've started to move on while the only year tick from the day was a Sandwich Tern on Gretchen Loch. Another scorcher followed on 2nd and saw the first bit of 'Corvid' passage with at least 11 Hooded Crows and 3 Rooks on the move. The Greenland White-fronted Goose was seen again and calm sea's enabled 12 Great Northern and 8 Red-throated Divers to be counted-fingers crossed for a White-billed soon! 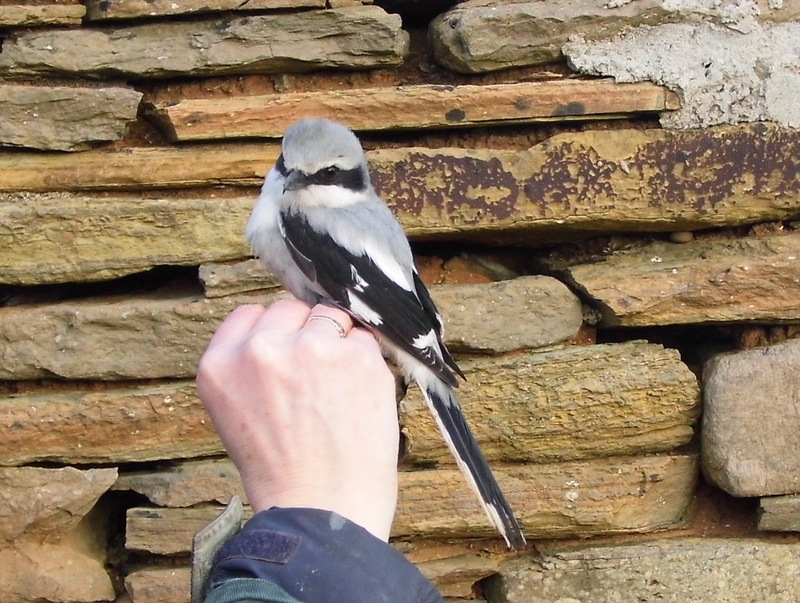 Passerine totals were slightly reduced again, although the first Brambling of the year and a White Wagtail were new, while the undoubted highlight came late in the day-a fine Great Grey Shrike caught and ringed at Holland gardens.